The panel of specialist solicitors who work with Legal Expert helping clients across the country are experienced in pursuing personal injury claim cases, such as people who have had a syringe needle infection, or other similar injuries. Our no win no fee solicitors can help people to recover the damages that they owed. Many of the solicitors we work with have years or even decades of experience in successfully pursuing personal injury cases, such as the syringe needle infection compensation case as described in this study. 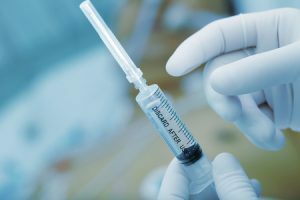 In this case study, we look at a personal injury case where a 32-year-old woman was awarded £10,000 for a syringe needle infection after being pricked with a needle which could have potentially infected her with a serious disease. The details and circumstances of the claim and injury have been adapted to protect the identity of the claimant. The main injuries that the claimant suffered were trauma, stress, and post-traumatic stress disorder. At the time of the accident, the claimant was an ambulance technician and was carrying out her duties at a person’s home. Whilst assisting the patient and taking out some bins, she suffered a syringe needle infection. At Legal Expert, we have helped claimants from across the country who have had injuries, such as a syringe needle infection to claim the compensation that they deserve. You can find out more about the circumstances of this case, as well as the injuries the claimant sustained by reading the details in our case study below. What Is A Needle Scratch Injury? The police, as well as prison workers and customs workers. A needle scratch injury is caused by the skin being broken or punctured in some way by a hypodermic needle. They can be caused either deliberately, or on purpose. Whilst the physical injury itself may cause some symptoms such as bleeding or swelling in the affected area, the most serious concern is the possibility for blood or other infected materials entering the victim’s body and bloodstream. Someone who has suffered a needle scratch injury will be concerned that they may have acquired a syringe needle infection. In this case, the claimant worked as an ambulance technician, a profession highlighted as being more at risk of infection. She was tasked to visit a patient at their home after they had collapsed. Whilst at the patient, she was carrying out tasks and was placing items in a bin provided by the ambulance service. As she did so she suffered a needle scratch injury due to the defective nature of the bin provided. Her finger was cut and she was, understandably, worried that she could have acquired an infection. After the injury, the claimants’ colleague informed her that the patient was HIV positive. This is one of the viruses which can be passed in syringe needle infection cases. The claimant was taken back to the hospital she was based at and was examined by a senior consultant for signs of needle infection symptoms. As a direct result of the syringe needle infection, she was informed that she now had a 1 in 300 chance of later contracting AIDS. The claimant was prescribed a course of 18 tablets per day for a month. The medication had a deleterious effect on her. She suffered a variety of side effects which caused her to be admitted to hospital on at least one occasion. She also had to take three weeks off work. The side effects also seriously affected her home life and during the treatment, the claimant was unable to kiss either her small children or partner. The side effects from the potential syringe needle infection lasted for six months. She suffered from stress, lack of sleep and needed to be prescribed antidepressant medication to help alleviate her symptoms. After six months, she had a blood test which revealed that she had no infection from needle injection and was clear of both Aids and HIV. The syringe needle infection compensation allegation was for psychological issues, including post-traumatic stress disorder. The claimant was assessed by a medical expert. They concluded that the psychological issues should be resolved in around fifteen months, but that the claimant would be vulnerable to additional stress for up to five years. Solicitors for the claimant held that the Ambulance Service was responsible for the injuries, having provided a defective bin and not carried out an adequate needle stick injury risk assessment. Whilst the claimants’ solicitors were able to establish that the injury was caused as a result of the defective equipment when the Ambulance Service was served with the compensation claim, they denied liability. As such, the case had to go to court. The judge found in favour of the claimant and she was awarded a total of £10,000 in syringe needle infection compensation. The compensation was awarded for the pain and suffering she felt, as well as the loss of amenity that she had during the six month waiting period. Taking legal action of any type can be costly, both financially and in the time a case can take. No win no fee contracts were designed to make sure that people who need to make a personal injury claim are able to do so without worrying about having to make an upfront payment towards the cost of their legal fees or ancillary costs. They are designed to help people who may not have the funds to have undertaken legal action if they had to pay upfront costs. At Legal Expert, we are able to offer claimants a no win no fee service. If the solicitor we match you with is successful in pursuing your compensation claim, you will need to pay for your solicitors’ services. The amount you will be charged is calculated and charged as a percentage of the compensation awarded to you. How this fee will be calculated is set out in your Conditional Fee Agreement. Contact the team at Legal Expert today and let our specialist legal solicitors start helping you to win the compensation that you deserve. Our professionals can start processing your claim for physical and psychological injuries caused as a result of a syringe needle infection. You can contact Legal Expert by emailing our team at info@legalexpert.co.uk. You can also speak to us directly by calling 0800 073 8804. You can also reach our team by using our online contact form or chat feature. What Infections Can Used Needles Pass On? Find out how long can diseases live on a needle and what to do if pricked by a used needle in this guide to needle injuries from the NHS. Find out how to conduct adequate risk assessments for needles and sharpes injuries with this guide and resources from the Health and Safety Executive. How Much Compensation For A Needle Stick Injury? Find out how much compensation you could be entitled to after suffering a needle stick injury in the workplace or other places with our guide to needle stick injury compensation claims.